Centre photo: David and I on Valentine's Day. Other photos: 1. The 'Coco Inspired' blouse, 2 & 3. 'Art Deco Love' dress and jacket, 4. A '1950's Gathered Skirt', 5. 'Fake Bunny Love' jacket, 6. 'The Sleuthing Cape', 7 & 8. 'We Were Made for Each Other' blouse and skirt gown, 9. 'Everybody Loves Parfait' purple pinafore, 10. The 'Groovy Spring' sheath dress, 11 & 12. The 'Shades of Purple' poncho and pants, 13 & 14. The 'Promenade Suit' jacket and skirt and 15. Burdastyle 'Polka Dot Surprise' dress. Centre Photo: David and I recreating a scene from 'The 39 Steps' Hitchcock movie. Other photos: 16. The 'Whippin' Something Up' apron, 17. The 'Almost Easter' dress, 18. The 'Serenity' gown, 19. The 'Royal Wedding' dress and hat, 20. The 'Paddington Goes to Scotland' dress, 21. The 'Kitten' dress, 22. The 'Union Jack Peek-a-Boo' hooded dress, 23. The 'Raspberry Sorbet' dress, 24 & 25. The 'Faux Wrap Blouse' and skirt, 26. 'Faux Wrap Blouse No. 2', 27. The 'Lady of the Lake' dress, 28. The 'Singin' in the Rain' jacket refashion, 29. The 'Now or Never' halter top, UFO. The 'Chocolate and Wine' dress, 30 & 31. The 'Watch Your Back' dress, 32. The 'Harbour Lights' dress, 33 & 34. The 'Ring of Fire' dress, 35 & 36. The 'Pretty Pendrell' blouse and 'Mrs. Peacock' skirt, 37. The 'Angels' culottes, 38. The 'Tribute' skirt. Photos: 39. The '99 Luftballoons' dress, 40. The 'Great Gatsby Affair' dress, 41. The 'Going Green' trousers, 42. The 'Razzle Dazzle' blouse, 43. The 'Around the World in 21 Days' dress, 44. The 'C'moooooon Poil!' swing jacket, 45. The 'Highland Ghost Pyjamas', 46. The 'Vitameatavegamin' blouse, 47. The 'Midcentury Madness' dress, 48. The 'Kitten' skirt, 49. The 'Bow Sweater', 50. The 'Revisiting My First Dress' collar and cuffs, 51. The 'Hawk's Eye View' dress, 52. The 'Pumpkin' dress, 53. The 'Déjà Vu' skirt, 54. The 'Scarlett O'Hara' dress, 55. The 'Starting with the Fabric' blouse, 56 & 57. The 'Deco the Halls' tunic and dress, 58. The 'Celebration' dress. Phew! I get tired just looking at all these photos :) The neat thing is how much each outfit embodies the time and place where it was made. So many great memories all captured in sewing!! Which is your favourite? What about you? What has been your favourite thing you've made this year? Wow, Sweetiepie, what a year it's been! It's amazing to see all of these great projects in one place, and to recall all the fun photo shoots. It was fun being part of it, and to help find locations to showcase your outfits. You've done an incredible job, keeping up with it whilst being busy in your day job. Looking forward to seeing what the new year brings and how your sewing will travel down new paths. But he is right, you have been a very busy bee and such amazing garments that you are wearing. What an inspiration you are to me - Thank You! Have a Happy New Year Debi! 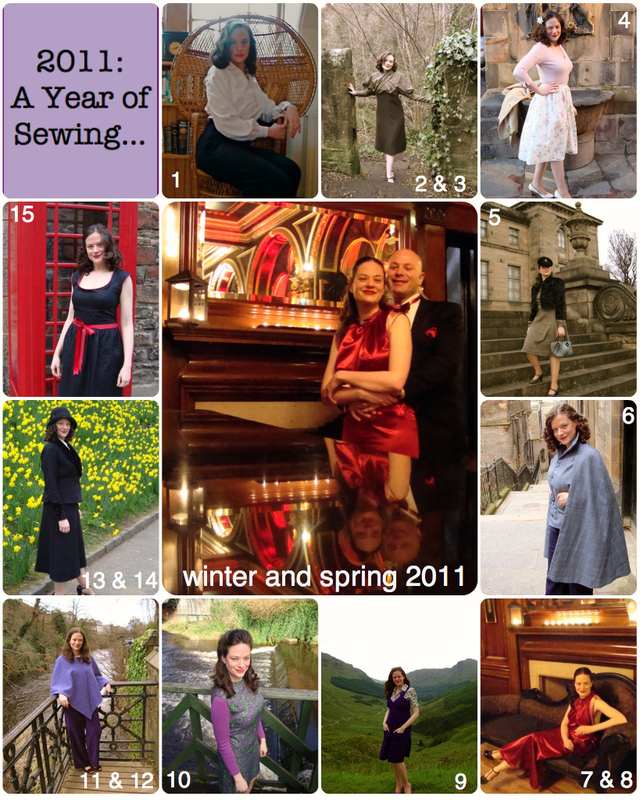 Wow--I am in total awe--what a lovely year in sewing. You are amazing! I love the Hitchcock recreation photo! Your photos are always interesting and fun. I feel exhausted just looking at how many outfits you've made - so much brilliant sewing, well done! 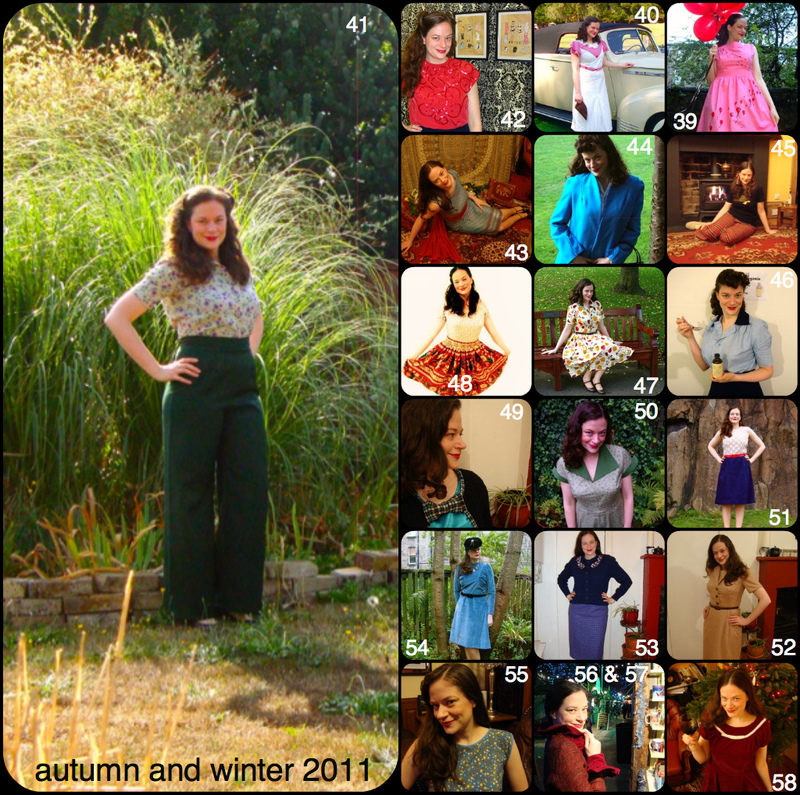 i love that you posted the whole year's worth of outfits pictures - i love EVERYTHING you made this year! my very very favorites are the 1950s tweed wiggle dress, the pendrell blouse & mrs peacock skirt, the midcentury shirt dress aaand the hooded dress. I love these collages Debi, they really highlight how incredibly productive you've been this year. It's really inspiring and I've loved following your journey and will continue doing so eagerly. It's impossible to pick a favourite make of yours, but I think your raspberry sorbet dress is absolutely stunning on you! It was a totally amazing year. Wow, you have been busy! Congratulations on completing the Sew Weekly challenge and then some! You've made some amazing pieces and should be proud! I hope you have an amazing New Year and I look forward to seeing what you've got planned next year! What a great way to celebrate your year of sewing! 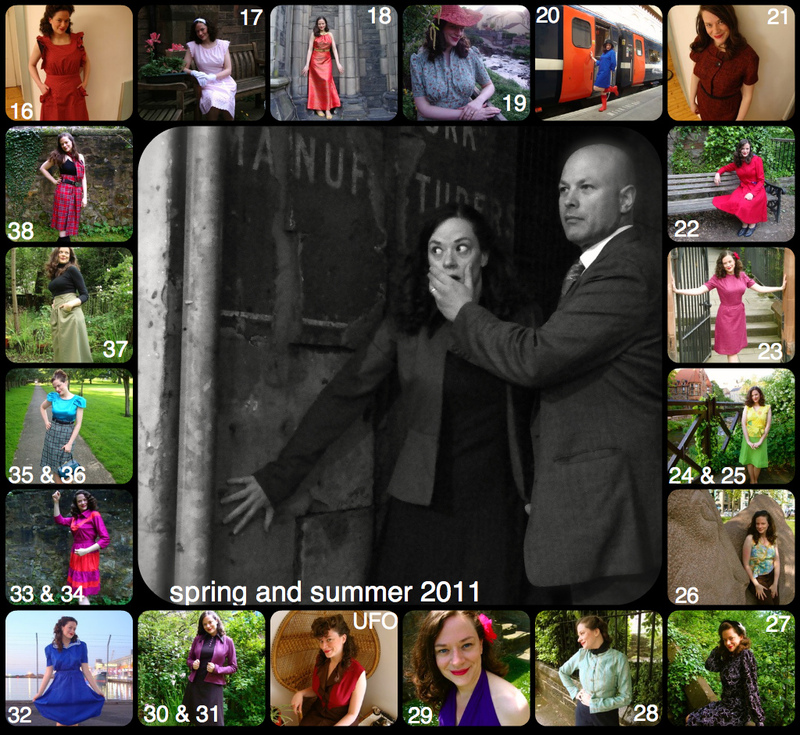 You have so many beautiful outfits there ~ it will be interesting to follow along on your sewing journeys in 2012! What a terrifically creative, delightful mosaic of events that made up your year. 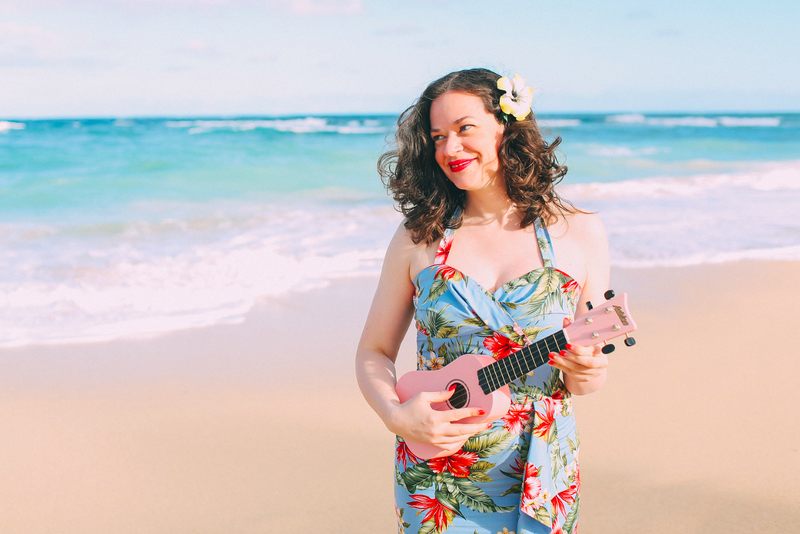 I adore every last one of your marvelous outfits and am positively inspired by them, too. Thank you very much for your sweet blog comment today, darling gal, I really appreciate it and hope you have a stellar New Year!!! Wow what alot of beautiful clothes you have made in only one year. I am definitely in awe. Happy New year . And what a fantastic year you had!! Your creations have been stunning as usual and I can't wait to see what you get on with in 2012. Wow Debi, seeing them all together like that is simply STUNNING! My favourite is still 2&3... Gorgeous! Wishing you a fabulously fun new year! What an amazing body of work. Wow! I really love your Pendrell blouse with the peacock skirt. They look so great together. Congrats on a wonderful sewing year! Funny that you should mention how each garment embodies the time and place it was made. Only yesterday I was listening to a fascinating radio documentary as I was sewing and I know I will think of it every time I wear the top I was making. Many of my garments instantly take me back to what was going on in my life at the time. Sometimes it's as simple as remembering perfect weather and birdsong and other times it's a lot more meaningful. Yet another bonus from making your own clothes! I'm impressed with the sheer number you produced this year and all so very lovely! Wow! What a year! You are so talented! And what an eye for great patterns! So many great clothes, and your pictures are always gorgeous! I am stunned by your sewing accomplishments!! Such an inspiration to see all your beautiful and varied projects together, you must be SO proud of yourself! Favourites of mine include The 99 Luftballoons Dress and The Great Gatsby Affair Dress. Thanks for this year, and can´t wait to see what the new year brings! Wow!! So many beautiful things sewn, congrats on an amazing sewing year! I am in LOVE with the green pants in 41. Thanks for your comment, and the same goes to you! You've been such an inspiration to me - even my year end review was inspired by this post of yours. I can't wait to see what the New Year has in store for you. I take my hat off to you, you really are a sewing inspiration!!! And I can't wait to see what you pull out of the bag for 2012! Green trousers + blouse + hairstyle = ADORABLE!! I was going to say the Mrs. Peacock outfit was my favorite, but I just love the trousers. Reminds me that I want to sew up a second pair myself this year! An amazing portfolio for 2011 - looking forward to seeing what you've got in store for 2012! Wow...very inspiring to see so many beautiful handmade clothes! I think my favourite has to be number 6 - I'm a sucker for a cape! What a fantastic year of creations!!! The green trousers are my absolute faves :) I hope to see them more in 2012!! Debi, you are a force to be reckoned with!!! Fantastic to see everything in one sitting. I finished the Sew Weekly challenge! !